This morning I woke up with the birds singing. Very early though! As I hadn’t been shooting the sunrise for a while, mostly because of bad weather, I actually was happy to see the sun shining so I could make some photos. Is that addiction to shooting? Yes, and that’s why I run the Photo Rehab Clinic and enjoy the company of many other patients! The first is the photo I made this morning. I wished I had been there earlier though, to catch the sun just rising, but this was anyways a great view to start my day. I am sharing the powerful sunset photo I made earlier this week as well. Check it inside the post. I don’t really know if I am more addicted to photography than to the images I see. I want to keep them forever in my mind, what makes the act of photographing just a means to an end. I think that is more the truth. Of the images of nature which touch me the most, the sun movement from dawn to dusk, is my preferred. I think it is the best metaphor for a life’s course. It is there, it goes on, and a lot happens between day and night, with or without our control. There is nothing we can do to stop it. So, instead of being upset with the birds or with myself, I at least got my photos done. It is not every day though, that I am taking the high road, or letting it go. I tend to take things way too seriously, and sometimes get upset with the silly things that happen to me or around me, (over)reacting to them. This behavior is not necessarily helpful, as there are people and situations outside of my control. So I may just get frustrated for nothing. While being at a party some days ago, someone said something to me that I could have taken personally. I didn’t react with anger but laughter. A friend who knows me very well, asked me surprised what made me change my attitude so much. My answer: Aging? Maturity? Both? Just learning (sometimes) to not take people nor life, too seriously. 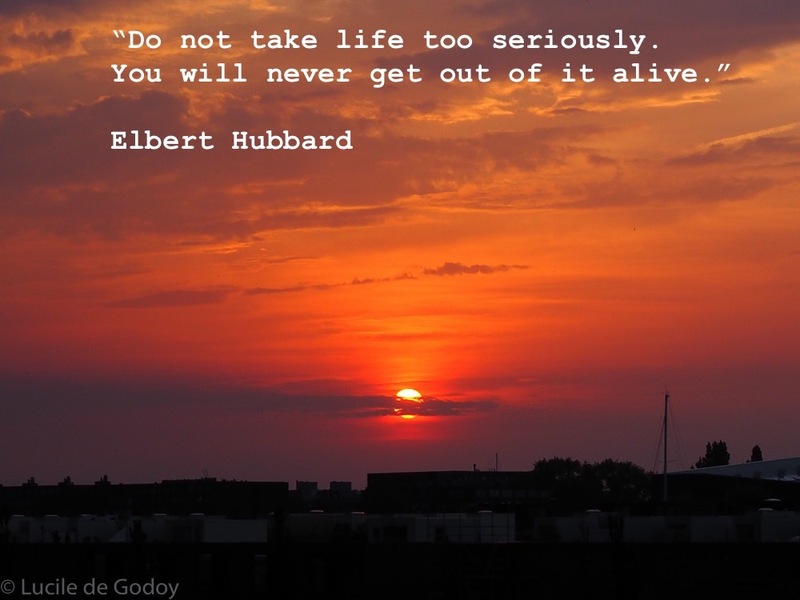 This quote from American philosopher, artist and writer Elbert Hubbard, goes to my blogger friend Colleen, from Silver Threading, featuring the best place your quote can be: The Writer’s Quote Wednesday. If You want to know more about him, here is the bio. Want to know how to join? Check below. This blog hosted ‘The Photo101 Rehab Clinic’ from 04 to 31 December 2014 and featured over 170 photos made by Photobloggers Andy Townend, Mara Eastern, Cardinal Guzman, DesleyJane, Justine, Amy, Teresa, Albert, Terri, Giving Thought, Ellen, Nalinki, Mariangeles, DwayCrafts, Lucy, Terri, Bampa’s Views, PeaceCrafting, Dreaming of Leaving and Project Easier. As former patients informed me that the withdrawal symptoms remained active, and new patients recognized the same symptoms, The Clinic – Photo Rehab reopened its doors. Time: The Clinic is open 24 x 7 until the healing process ends. Camera: You can use any camera, from DSLR, mirrorless, compact, to smartphones. Theme: Bring your creativity and photograph a theme of your liking in B&W or Color. With or without edition. We like learning techniques as well, if you want to share it with everyone. Who can join: Anyone can join; and not only former Photo 101 bloggers. All you need is passion. Passion to speak up through images – or words, if you may want to add your thoughts to it as well – showing what you see and how much that is important to you. Thanks for joining and enjoy it. Your photo is lovely and so worthy of getting up early in the morning. Learning to let things go is challenging. Good for you for doing so. You will be happier for it. It’s a daily exercise though, otherwise I may not even noticed that in back to old patterns. Being happier though it’s the best reminder. Thanks. i think photography is very much the same as blogging/journaling. in the end, it’s all about preserving memories of those special moments in our lives. Thanks for visiting and for your insightful comment. Very much appreciated. Same here, it’s rising before 5am so it’s a bit too much! Agree with you. I’m settling with sunsets. The quote is in the second photo inside the post. Thanks and have a beautiful day. Thank you for dropping by and commenting. Appreciated. Lucile! Your Wednesday sunrise is an amazing sight and I’m glad the weather is better…your post comes exactly right when I need it… Something is churning in my mind that requires me to repeat your quote about not taking life too seriously!!! Thanks for reminding me!!! Much love and gratitude…. I know so well that feeling…so please, don’t take it seriously. Whatever it is. It’s never worth our while. You’re too precious to be bothered by anyone or anything irrelevant. Thank you my dear for your very helpful words: ) indeed I must just take a breath and relax… Thanks for your advice!!! Good morning, Lucile~ I love your sunrise photos, just beautiful! Thank you for the reminder of not taking things too seriously. We need to enjoy each moment we have and not waste it on being upset or worrying about things we have no control over. People will act they will and things happen the way they will and we can not change them….all we can do is change ourselves and are perceptions. Many blessings on the beautiful day! Good morning, Barbara. And thanks for the compliments. The sun is an easy model, always delivering amazing and different views. So here goes the credits to the author of so much beauty. Your words should be added to my post. So true and powerful. Thanks. Good for you, Lucile. Life is funny like that. I am way to serious about life sometimes too. I’m still learning. I guess we’re all flawed to some extent. 💕 Good quote! I guess we reduce the seriousness as we became more and more aware of when we are falling in the trap! Looks like the sun is blessing the city. I’m knocking on wood to make sure it lasts a little while. Crossing fingers and toes too! I like that first photo. It looks like the sun is sitting on the bridge. Thank you for visiting and appreciating the photo! The same happens to me, whenever I see something that touches a special cord in my soul/heart/brain/sight……! Parties! The worst possible place for hearing all the wrong things 🙂 But I love that quote. Hope the week gets better. I can’t disagree with you. I love it so much. Well, some parties and drinks just bring the worse out of some people. Have a wonderful weeked, lovely lady! What a lovely post with such a personal touch to it. I think that it shows that we are all vulnerable and like you, I sometimes take things too seriously. Looking at the sunrise each day is one way of being more aware of ourselves and how lucky we are to see it. I love the quote too – so very true. Thanks again. Debbie, what an insightful comment. Love it. Thanks much for that. And have a lovely weekend! Well done, well written and simply gorgeous, my talented friend! Funny how we will do most anything for a great photo (like lose sleep, etc). Now that I blog, I think about what could be a good photo I could share or write a story about. I believe someone else mentioned that too. We are just being good chroniclers(?) of good information, stories and beauty! Wow Terri, thanks much for such a considerate and insightful comment. Thanks much. Appreciate your support. I love your sunrise photo, the colours are so vivid and warm. It is really interesting o see that bridge again and compare the photo to your header. Same same but so different! Thanks Leanne. Indeed it’s always different. You cannot imagine how many photos I have of this bridge, and how many more I will still make! The bridge and we, miss you too! It’s not. I have to keep reminding myself. Thank you!